As a nod to the ROW’s produce market roots, the retailer Bodega has installed a fruit stand at the front of its space. Walk past the plastic curtain to sample its rare kicks. Built between 1917 and 1923, the six-building, 32-acre complex is the focus of big plans: There are more than a dozen retailers so far, with room for 100 plus 15 restaurants and loads of office space. Take time to check out the 30,000 square feet of murals painted by local artists throughout the facility. The Bridge & Burn here is the only place in the U.S. outside the Portland flagship to score its urban lumberjack duds. It’s worth stopping by just to bask in the woodsy scent of the candles. Charged with spearheading the adaptive reuse of the complex, L.A. architecture firm Rios Clementi Hale Studios added gardens, shade trees, and plazas. At the same time, the firm was careful to preserve the industrial look of the complex’s buildings, which go back to the early 20th century. 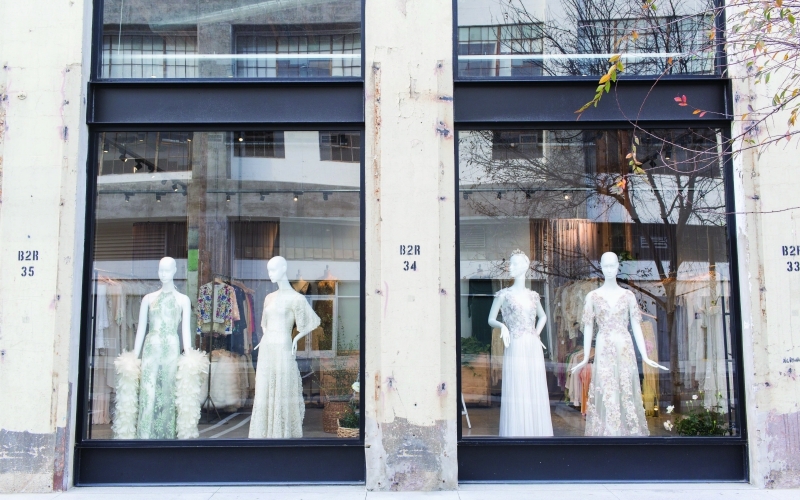 ROW tenants host in-store pop-ups, block parties, yoga sessions, and live music nights. (It was also the venue for our recent Best New Restaurants soiree.) For current happenings, check their website. Rose Apodaca and partner Andy Griffith were the first tenants to come aboard, in 2016. Filled with design-focused furniture and home goods, their showroom, A+R, doubles as an event space for dinners and design talks. ROW DTLA, 777 S. Alameda St., downtown.